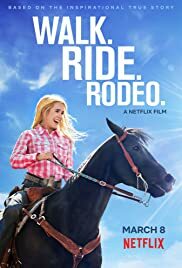 Amberley Snyder (Spencer Locke)’s dreams of a college scholarship and pro rodeo career are brought to a halt when she’s involved in a devastating accident. Based on the incredible true story, Walk. Ride. Rodeo co-stars Missi Pyle, Bailey Chase, Sherri Shepherd, and Max Ehrich.